David Duke and Richard Spencer have small numbers of fringe supporters and they’re considered to be pariahs on the Right. Just to give you a rough idea of their support, even the unreliable and highly suspect Southern Poverty Law Center estimates that there are only somewhere between 5,000-8,000 KKK members in the United States. In other words, those numbers could be high by a substantial amount. In addition, Duke and Spencer are universally reviled by every mainstream conservative publication and no Republican in Congress wants to be associated with them. In fact, the only reason anyone talks about either of them at all is because the liberal media incessantly builds them up and amplifies their message in an effort to tie them to Republicans who want nothing to do with them. On the other hand, the dishonorable Louis Farrakhan’s Nation of Islam is estimated to have somewhere between 20,000-50,000 members. Farrakhan has met with a number of liberal celebrities including Stevie Wonder, Snoop Dogg, Eminem, Mary J. Blige, Ice Cube, Chuck D, Ludacris, 50 Cent, DMX, T.I., Busta Rhymes, C Lo Green, Kendrick Lamar, The Game, Kanye West, Kim Kardashian, Jada Pinkett and Will Smith. Left-wing social media network Twitter, which has made a big deal about publicly pulling the accounts of prominent racists, has allowed Farrakhan’s account to stay up. At least seven Democrats, including “California Reps. Maxine Waters and Barbara Lee, Illinois Rep. Danny Davis, Indiana Rep. Andre Carson, Minnesota Rep. Keith Ellison, New York Rep. Gregory Meeks and Texas Rep. Al Green” have taken meetings with Farrakhan while in Congress and there are many other prominent Dems (including Rahm Emanuel) who have cozied up to him. 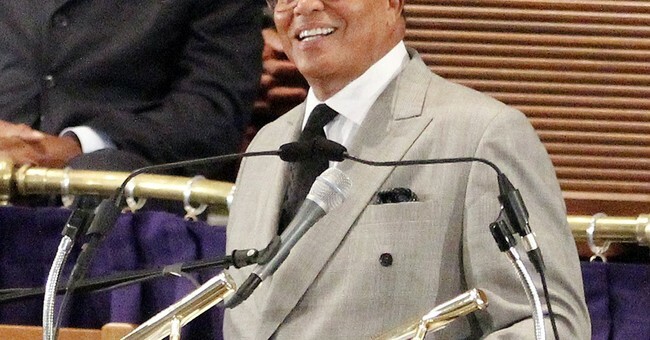 Even former President Barack Obama is connected to Farrakhan. Not only did he take a side by side smiling picture with him, the Nation of Islam has actually worked on his political campaigns. 1) "The die is set, and Malcolm shall not escape, especially after such evil foolish talk about his benefactor, Elijah Muhammad. Such a man as Malcolm is worthy of death." -- Louis Farrakhan in 1964 on Malcolm X, who was later murdered by Nation of Islam members. 2) “Now that nation called Israel, never has had any peace in forty years and she will never have any peace because there can never be any peace structured on injustice, thievery, lying and deceit and using the name of God to shield your dirty religion under His holy and righteous name.” -- Louis Farrakhan in 1984. 3) "The Jews don’t like Farrakhan, so they call me Hitler. Well, that’s a good name. Hitler was a very great man." -- Louis Farrakhan in 1984. 4) "Murder and lying comes easy for white people." -- Louis Farrakhan in 1994. 5) "Many of the Jews who owned the homes, the apartments in the black community, we considered them bloodsuckers because they took from our community and built their community but didn't offer anything back to our community. When the Jews left, the Palestinian Arabs came, Koreans came, Vietnamese...and we call them bloodsuckers." -- Louis Farrakhan in 1995. 6) "They call them [Hezbollah] terrorists, I call them freedom fighters...No one asks why they would do such a thing. Why would they do such a thing? What has driven them to this point? That's what the UN, the U.S. and Europe doesn't want to deal with because the Zionists have control in England, in Europe, in the United States and around the world." -- Louis Farrakhan in 1996. 7) “Qaddafi is hated because he is the leader of a small country that is rich, but he uses his money to finance liberation struggles. And since he’s financing liberation struggles against imperialists and Zionists and oppressors, the Zionists hate him, the imperialists hate him, the neo-colonialists hate him, America hates him. Well, you must be all three. I love him.” -- Louis Farrakhan in 1996. 8) "A decree of death has been passed on America. The judgement of God has been rendered and she must be destroyed..." -- Louis Farrakhan in 1997. 9) "The Jews have been so bad at politics they lost half their population in the Holocaust. They thought they could trust in Hitler, and they helped him get the Third Reich on the road." -- Louis Farrakhan in 1998. 10) "White people are potential humans - they haven't evolved yet." -- Louis Farrakhan in 2000. 11) "The white man is our mortal enemy, and we cannot accept him. I will fight to see that vicious beast go down into the lake of fire prepared for him from the beginning that he never rise again to give any innocent black man, woman or child the hell that he has delighted in pouring on us for 400 years." -- Louis Farrakhan in 2002. 12) "I’m not into integration. I ain’t for that. God told the Jews, he didn’t want you intermarrying with others. But you disobeyed him. He don’t want us uniting into this that he’s come to judge. You can’t integrate with wickedness if you want righteousness." -- Louis Farrakhan in 2003. 13) "The final thing is the destruction. The Honorable Elijah Muhammad told us of a giant Mother Plane that is made like the universe, spheres within spheres. White people call them unidentified flying objects (UFOs). Ezekiel, in the Old Testament, saw a wheel that looked like a cloud by day, but a pillar of fire by night. The Hon. Elijah Muhammad said that that wheel was built on the island of Nippon, which is now called Japan, by some of the original scientists. It took 15 billion dollars in gold at that time to build it. It is made of the toughest steel. America does not yet know the composition of the steel used to make an instrument like it. It is a circular plane, and the Bible says that it never makes turns. Because of its circular nature it can stop and travel in all directions at speeds of thousands of miles per hour. He said there are 1,500 small wheels in this Mother Wheel, which is a half mile by-a-half-mile. This Mother Wheel is like a small human built planet. Each one of these small planes carry three bombs." -- Louis Farrakhan in 2011. 14) “L. Ron Hubbard himself was and is trying to civilize white people and make them better human beings and take away from them their reactive minds … Mr. Hubbard recognized that his people have to be civilized.” -- Louis Farrakhan in 2011. 15) "Another method (of depopulation) is disease infection through bio-weapons such as Ebola and AIDS, which are race targeting weapons. There is a weapon that can be put in a room where there are Black and White people, and it will kill only the Black and spare the White, because it is a genotype weapon that is designed for your genes, for your race, for your kind." -- Louis Farrakhan in 2014. 16) "White people deserve to die, and they know, so they think it’s us coming to do it." -- Louis Farrakhan in 2015. 17) “It is now becoming apparent that there were many Israelis and Zionist Jews in key roles in the 9/11 attacks. Israelis had foreknowledge of the attacks... We know that many Jews received a text message not to come to work on September 11.” – Louis Farrakhan in 2015. 18) “I don’t know what the hell the fight is about over the Confederate flag. We need to put the American flag down. Because we’ve caught as much hell under that as the Confederate flag. Who are we fighting today? It’s the people that carry the American flag.” -- Louis Farrakhan in 2015. 19) "Osama Bin Laden didn’t destroy the Twin Towers. That was a false-flag operation to take the world’s attention away from the great disunity in America after George W. Bush stole the election." -- Louis Farrakhan in 2016. 20) "America will never be made great again. Her days of greatness are over. The God of justice has come." -- Louis Farrakhan in 2017.